The ocean is the surface studied by the majority of altimetry applications, and some missions are even optimised for it. Ultimate applications include oceanography itself, as well as the implications of ocean movements on climate (and vice-versa, the effects of climate change on the ocean). 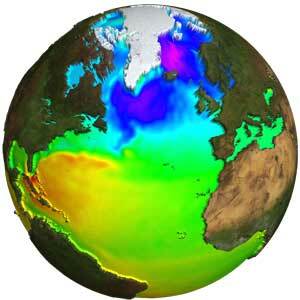 Ocean currents can raise sea surface height by up to a metre higher than the surrounding area. Currents can therefore be mapped by measuring height variations. Satellite altimetry, supplying continuous worldwide observations, has been increasing our knowledge of ocean circulation since the 1978 Seasat mission. The ocean is also a turbulent environment — especially so in the major current areas–, where ‘mesoscale’ eddies (i.e. eddies measuring about 50-500 km across) are generated and move. The goal of operational oceanography is to describe in real-time and to forecast such ocean dynamics, with altimetry supplying the most important data for assimilation. The tides, another ocean phenomenon seen by altimetry, can now be gauged to within 2 cm, thanks largely to altimetry. This has helped to improve our understanding of Earth-Moon interactions such as the Moon’s impact on the length of the day on Earth, and has given some insight into one of the driving forces of the Earth’s climate system. Last, but not least, by tracking changes in sea level, altimetry helps us to monitor mean sea level, its time variations and geographical patterns. Many studies are ongoing, in the context of research into the greenhouse effect.